Comments Off on Where to Find Northern Lights? Northern Lights or aurora borealis are searched by lots of people because they are rare phenomena. If finding Northern Lights is your goal for your next travel plan, you must know where to find Northern Lights. For your information, there are only few places where you can find them. That is why you need thorough preparation and great plan for this type of travelling. Catching this type of spectacular natural show is hard to experience. It is not always being in the right place but also being in the right time. That is why this should be included in your bucket list. At least you experience this once in your lifetime and you won’t regret it. Manitoulin Island, Ontario is one of few places you can visit to watch directly the epic natural show of the Northern Lights. The light pollution makes this place a top list destination to see the Northern Lights. Not only tourists who are interested to visit this place but also professional photographers who want to catch the great phenomena of aurora borealis. Fairbanks, Alaska is another best destination to find Northern Lights or aurora borealis. This is due to the location is beneath the aurora oval which makes this place the best spot to see the epic show. There is also peak aurora season which runs from September to late March. So this is the best time to prepare your travel plan to this place. Tromso, Norway is also a great spot to find Northern Lights. The dynamic culture along with breathtaking scenery is enough reason to make you visit this place. For those who seek for adventure travelling, this is the best place to visit. You can also watch the aurora dance across the sky at night which makes this place even more beautiful to see. Caithness and Sutherland, Scotland are a set in the Scottish Highland where you can epic Northern Lights. This place is not technically located in the aurora oval. However, the open landscape shows the most breathtaking view of the aurora. The view is so dramatic that you will even forget that what you see is real. Borgarnes, Iceland is a great choice of best spots to find aurora borealis. The mountains, glaciers, and the black beaches are included into a package beauty of Borgarnes. All those breathtaking spots can be enjoyed in one place. When it comes to find Northern Lights, this is absolutely the top list to visit. Reykjavik, Iceland is an urban area but you still have chance to find Northern Lights during the high season of aurora. 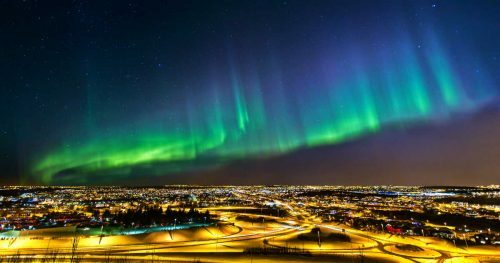 Make sure to rent a place in less polluted area o you can see clearly the Northern Lights.